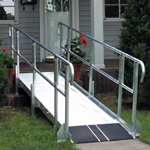 Modular wheelchair access ramps are available for permanent or long term use to access buildings. While more expensive than other portable wheelchair ramps modular ramp systems have benefits for many people that a permanent or portable ramps can't compete with. The first benefit of modular wheelchair ramps is that if the user moves the modular ramps can be disassembled and reassembled in new location. The second of modular wheelchair ramps is, if the day comes that the ramp is no longer needed, the modular system can be sold, given away or donated. Wooden ramps which are built on site are basically scrap lumber once it's need is no longer there. 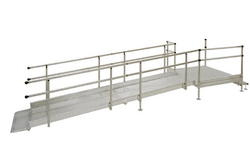 Modular wheelchair ramps may include platforms, landings, leveling systems, self contained supports, wheels, flanges, and handrails as required. The modular ramp sections are normally aroud 4' in length and connected together using bolts or clamps. Many manufacturers of modular ramps offer custom dimensions and will ship all of the parts required with installation instructions. 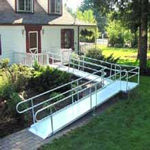 Most modular wheelchair ramps are made of aluminum and are designed to be raltively maintenace free and long lasting. If the modular wheelchair ramp is going to be moved to a new location additional sections and part can be ordered if needed to fit the new location. Weight Capacity: 750 lbs (341 kgs.) or 100 lbs (45 kgs.) per sq. ft. Weight Capacity: 100 lbs (45 kgs) per sq. ft.